So I am in Seattle for the week and I brought a puzzle to keep me out of trouble! I am never gonna finish it before its time to go. This puzzle is harder than I thought but a lot of fun. There's no way I would ever attempt this one. I have to have lots of color variation in order to make it fun for me. I can understand why you would do it...the challenge itself. Do you just have to pick up every single piece and try it since you have no idea what shape is next (other than the border of course)? It is actually very enjoyable. The pieces are so unique in shape, there is almost limitless differentiation which makes it very enjoyable. Yes, it is challenging, but after doing large solid color sections, it exercise the shape matching parts of your brain and helps you even when you are pattern matching or color matching in other sections of puzzles. Its sort of like doing a large section of greenery in a landscape, you have to use shape matching and you become aware of minute differences in shade. But the two together, solve the puzzle. You know, you should be a jigsaw puzzle salesman...you really are convincing, and sold me already on two possibly three (4 Maps, Rizzi City, and possibly Double Retrospect) puzzles that I would never have considered buying otherwise, but I just can't imagine doing Krypt any time soon. Possibly after I get some more experience with doing large format puzzles and the finding of repeat patterns. Right now I haven't really put into practice the technique of using the repeat patterns to make it easier for myself. I want to learn to do that without having to build on top of the previous section the way that the Slater family does. It would just drive me batty. I'm going to try doing the rubbing thing soon though if I can find a piece of paper big enough for a 1,000 piece rubbing to get the full repeat pattern on Life. So what puzzle are you guys going to start on when you get back? And, when are you going to update with your new puzzle purchases? I always love seeing what you guys get and the good prices too. 5,000 piece Views of Modern Rome for $10 on Craigslist. Thanks for the heads up! I contacted the tropical impressions person. We will see what happens. I told M no more puzzles for a while.. We just spent WAAAAAYYYYYY too much money on some collectiable ones. HINT: Just picked up the very rare 10,000 piece garden of earthly delights. Very cool. I hope you get it if you want it. Congrats on the garden of earthly delights as well. You've got your work cut out for you that's for sure. 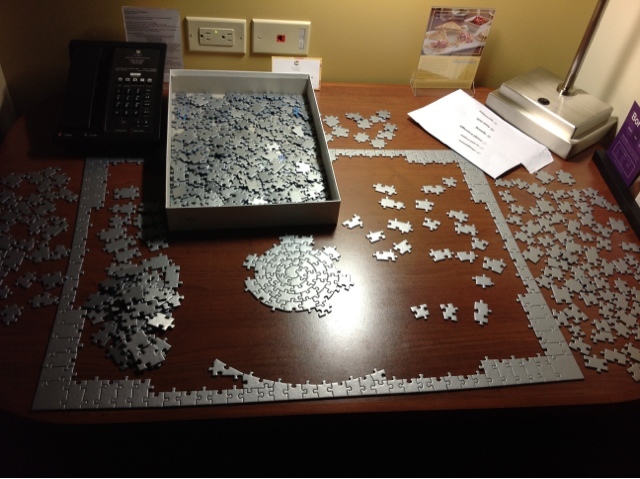 When do you need to have your first puzzle building service project for Dawn finished? Are you guys going to start it as soon as you get back from Seattle? As soon as we finsish whatever we are working on when it shows up. It will go to the top of the stack. I start flying home today, had to pack up Krypt. Cant wait to get home! I miss M really bad. It was good being in Seattle, getting some facetime at the company, seeing friends and eating/drinking well but its time to get home! That sounds good. Is the company you work for headquartered in Seattle? It's not Microsoft is it? LOL Were you able to pack up Krypt and keep the pieces you've already worked on intact? That would stink if you weren't. I bet you miss her. I know my husband always gets homesick after a couple of days away. You have to update the blog with your new collectible purchases....I'm dying to see what else you got. Here's a you guys type of puzzle that's only $10.00 right now. 4 historical maps first section completed!! !